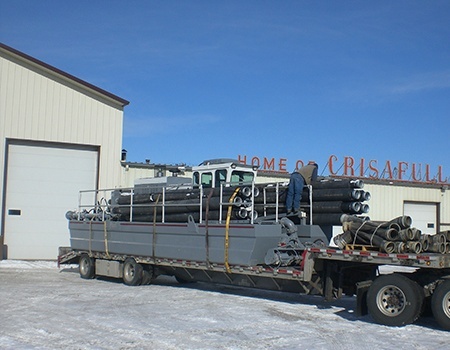 Crisafulli manufactures eight standard hydraulic dredge models - four models of the portable self-propelled Rotomites (Rotomite-6000, Rotomite-6000 CD, Rotomite-6000 CE, and Rotomite SD110), and four models of its portable remote controlled, automated electric powered FLUMP (floating lagoon pumper) series (3-inch stand duty, 3-inch severe duty, and 4-inch severe duty), and the diesel powered FLUMP, the RDF-75. Crisafulli will custom engineer each of its standard models to meet customers' specifications. Crisafulli dredges use horizontal augers. 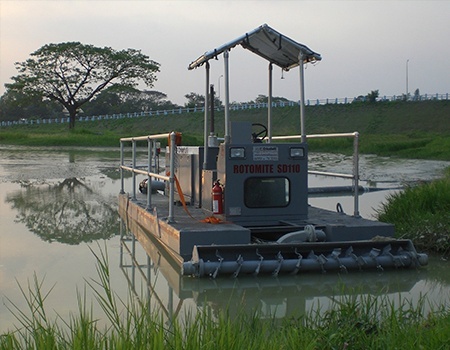 Rotomites are self-propelled and steerable and operate without expensive support vessels. 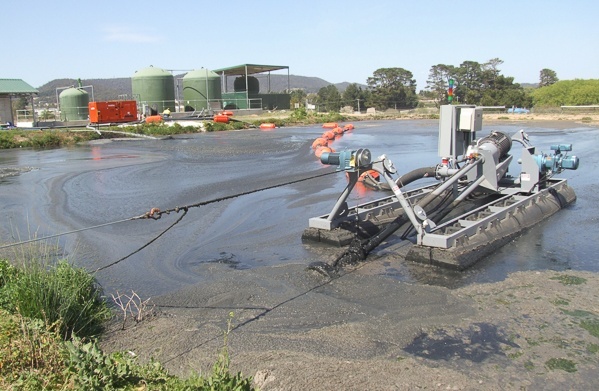 FLUMP dredges operate in a cabled environment, are remote controlled, and can be partially or fully automated. 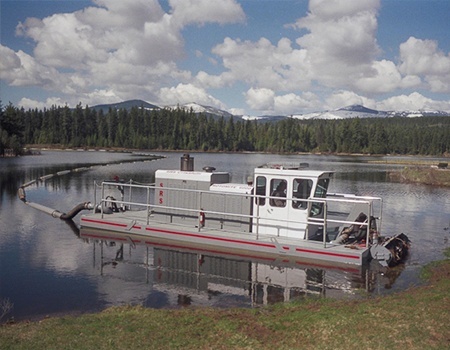 Customers use our equipment to dredge biosolids and residuals from municipal water and wastewater lagoons; dredge industrial lagoons of waste, mine tailings, sediment, or slurries; remove settled solids from ponds or lagoons without draining the ponds or taking ponds out of service; implement or manage conservation projects, including maintenance of small ponds. *Also available in aluminum, which weights 7,000 Lbs. As a global leader in dredge manufacturing, Crisafulli has earned a reputation as a builder of reliable high-value products supported by superior service and leadership in its product groups. Crisafulli FLUMP and Rotomite dredges offer customers "Best Value": excellent performance, competitive prices, reliability, low operating costs, and superior service worldwide. 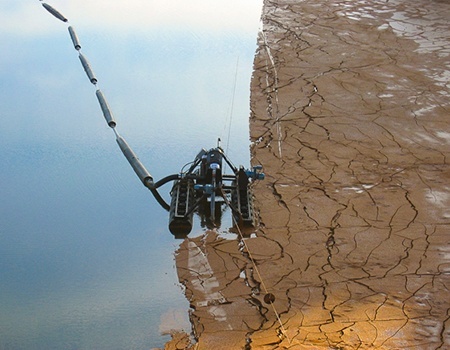 Dredge lagoons, lakes, canals, sludges, or slurries with self-propelled Rotomite Dredges. 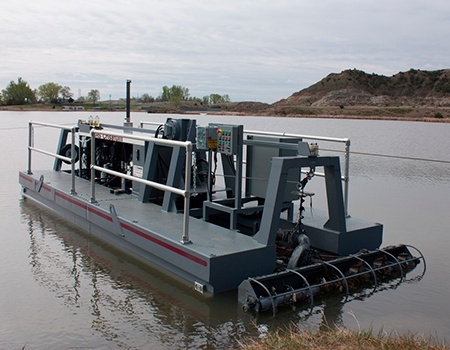 Self-propelled diesel dredges can dredge about anywhere without cumbersome cabling. Rotomite 6000s are diesel powered and engineered for low cost high productivity removal of soft to mildly abrasive slurries. Rotomite 6000 CDs are diesel powered and engineered to remove the full range of material from soft to highly abrasive, such as sand. Rotomite-6000 CEs are electric powered and dredge soft-to abrasive materials. 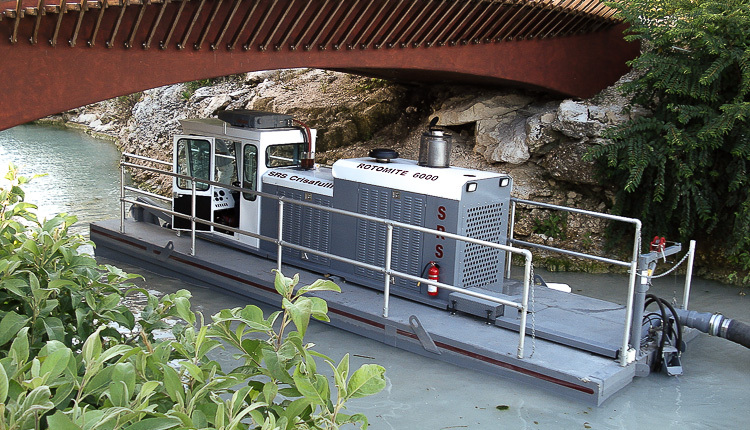 Rotomite SD110s are smaller dredges engineered for applications in shallow water – i. e., marinas. Operating Efficiencies and Costs. All Rotomites are self-propelled to provide unparalleled control and flexibility afloat. On land, Rotomites are easily portable at highway speeds by truck. 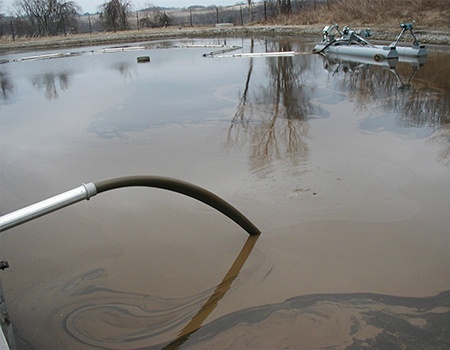 You can dredge in any shape pond, lake or lagoon. Rotomites eliminate the need for cable control systems or expensive support vessels or spuds. 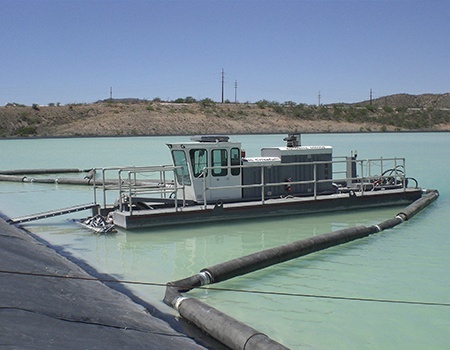 Rotomites can be operated by one man thereby reducing operating costs as compared to competitive dredges. Custom engineered Rotomites can be radio-remote controlled from the shore. Coupled with the Crisafulli sludge pump, the Rotomite's 275 HP John Deere power plant delivers efficient, continuous productivity; you can rely on up to 2,300 gal/min pumping capacity to ensure that your work day is uninterrupted by refueling. Rotomites have fuel tank capacity for 10 hours of continuous operation. 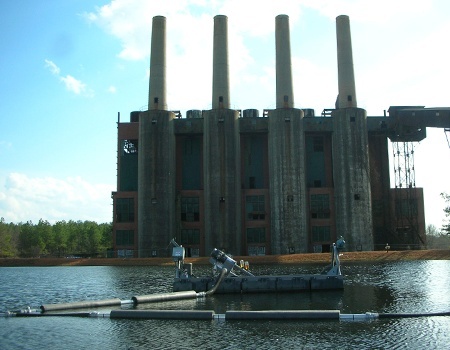 Dredge Installation and Training Services. Crisafulli provides installation and training services for customers across America and Worldwide.